Below are the component reports of the 2017 Purchasing Card Benchmark Survey Results. Please click on the title of the report in order to read a brief description and then click the button on the right to add it to your cart. If you were a participant in this survey, or if you would like to place a bulk order, please contact Professor Palmer directly for more information (Richard.Palmer@RPMGresearch.net). This report provides data curated for purchasing card administrators (PCAs), and deals with the choices surrounding card program management. Specifically, topics discussed include norms for employee resource commitment, training and communication policies, receipt and documentation archival practices, program evaluations and performance monitoring, the use of mandates, spending limit management, electronic transaction controls and other risk management activities, card issuer communications, and the progress of data integration and completeness. This report presents data that relate to the role that card issuers play in purchasing card program success. Trends over the past nine years of the customer ratings of the importance of and satisfaction with the financial relationship with the card issuer, customer service and support, card issuer technology, data capture, data integration, and reporting software are examined for insights to enable issuers to evaluate their progress and plot specific improvements to meet customers’ needs. This report presents benchmark data points for Fortune 500-Size corporations, including: average number of plastic purchasing cards; card-to-employee ratio; average monthly p-card spending; the percentage of transactions paid with p-cards; spending per transaction; monthly transactions per card; spending per card; and the percentage of active cards in a typical month. This report presents benchmark data points for Large Market corporations,including: average number of plastic purchasing cards; card-to-employee ratio; average monthly p-card spending; the percentage of transactions paid with p-cards; spending per transaction; monthly transactions per card; spending per card; and the percentage of active cards in a typical month. 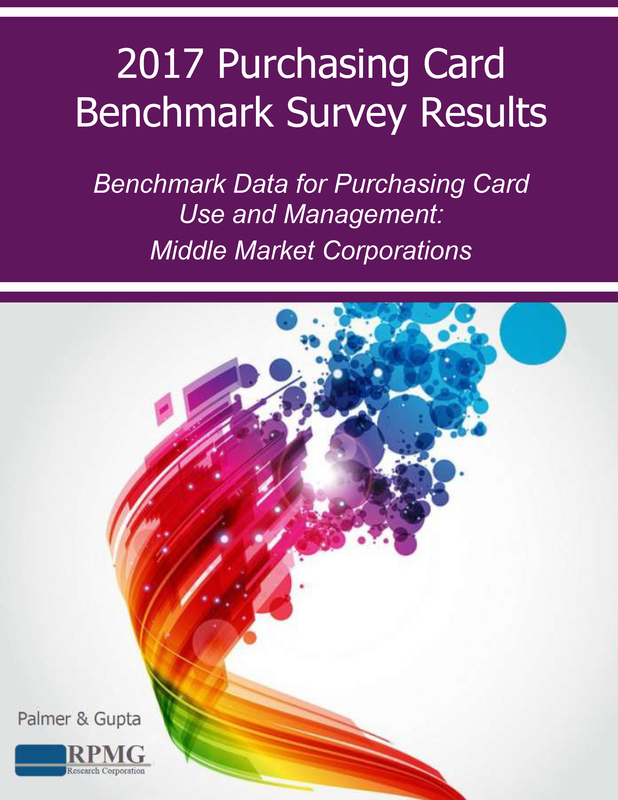 This report presents benchmark data points for Middle Market corporations, including: average number of plastic purchasing cards; card-to-employee ratio; average monthly p-card spending; the percentage of transactions paid with p-cards; spending per transaction; monthly transactions per card; spending per card; and the percentage of active cards in a typical month. This report presents benchmark data points for Small Market corporations, including: average number of plastic purchasing cards; card-to-employee ratio; average monthly p-card spending; the percentage of transactions paid with p-cards; spending per transaction; monthly transactions per card; spending per card; and the percentage of active cards in a typical month. This report presents benchmark data points for States and State Agencies (large, mid-size, and small), including: average number of plastic purchasing cards; card-to-employee ratio; average monthly p-card spending; the percentage of transactions paid with p-cards; spending per transaction; monthly transactions per card; spending per card; and the percentage of active cards in a typical month. This report presents benchmark data points for Cities and Counties (large, mid-size, and small), including: average number of plastic purchasing cards; card-to-employee ratio; average monthly p-card spending; the percentage of transactions paid with p-cards; spending per transaction; monthly transactions per card; spending per card; and the percentage of active cards in a typical month. This report presents benchmark data points for Colleges and Universities (large, mid-size, and small), including: average number of plastic purchasing cards; card-to-employee ratio; average monthly p-card spending; the percentage of transactions paid with p-cards; spending per transaction; monthly transactions per card; spending per card; and the percentage of active cards in a typical month. This report presents benchmark data points for School Districts (large, mid-size, and small), including: average number of plastic purchasing cards; card-to-employee ratio; average monthly p-card spending; the percentage of transactions paid with p-cards; spending per transaction; monthly transactions per card; spending per card; and the percentage of active cards in a typical month. This report presents benchmark data points for Not-for-Profit organizations (large, mid-size, and small), including: average number of plastic purchasing cards; card-to-employee ratio; average monthly p-card spending; the percentage of transactions paid with p-cards; spending per transaction; monthly transactions per card; spending per card; and the percentage of active cards in a typical month. The 2017 Purchasing Card Global Benchmark Survey Results (the “Report”) is RPMG Research Corporation’s inaugural edition of the Purchasing Card series for organisations located outside of the United States and Canada. The report analyses the responses of card users from eleven different card issuers regarding purchasing card value, spending patterns, growth potential, supplier acceptance, and card misuse. Additionally, where applicable comparisons to U.S. and Canadian card programmes are made to highlight the cultural and organisational differences among global programmes. Key topics discussed in the global report are summarised below.